Space Tracking and Surveillance System. The Space Sensor Layer was one of the headlines from last week's release of the 2019 Missile Defense Review, the first update to the nation's missile defense posture in nine years. The Pentagon views the Space Sensor Layer as a necessary military response to Russia's and China's looming deployment of hypersonic missiles. The existing U.S. missile shield was designed to counter North Korea's and Iran's intercontinental ballistic missiles. Hypersonic weapons that fly at several times the speed of sound are a different threat, as they maneuver in unpredictable trajectories and glide to their targets. Defense officials and analysts have argued that these advanced weapons could easily penetrate current U.S. defenses that rely on ground and sea-based sensors to track enemy missiles after they are launched. "It's not all about ICBMs," Griffin said. He explained the Space Sensor Layer will serve in a defensive role to detect and track incoming missiles, and also as a tool of war to help destroy targets. "I think you'll see operational systems in the mid and latter part of the 2020s," Undersecretary of Defense for Policy John Rood said of the space sensors. Griffin insisted the Pentagon will be steadfast in moving this project forward. "You'll start to see some experiments materialize over the next very few years," he said. "Those of us at a high level in the department are really here only for a limited period of time and we want to see some action. So stay tuned." Space-based sensors for missile defense also received full support from Congress. The 2019 National Defense Authorization Act directs the Pentagon to "complete a plan and initiate development" of a space-based missile defense sensor architecture. Appropriators added $73 million to the Defense Department's 2019 budget to begin the work. The Space Sensor Layer nonetheless faces significant technological and political hurdles. The new Democratic leadership in the House already has warned it will challenge any new spending on missile defense systems. The chairman of the House Armed Services Committee Rep. Adam Smith, D-Wash., said in a statement that he would oppose any effort to "rush to buy and deploy unproven missile defense systems." An industry source who spoke on condition of anonymity because he works on defense contracts suggested that the Space Sensor Layer, like the Space Force, could turn into a partisan lightning rod. President Trump announced during a controversial speech at the Pentagon last week that he will request funding in 2020 for space-based missile defense, increasing the chances that the project will be caught in the political crossfire. The Missile Defense Agency is evaluating nine proposals for space sensor architectures. With the $73 million that Congress already appropriated, the agency will proceed to the next phase. Of the nine submissions, three will be selected this year to continue working on the project for another six to nine months. Any further development work will require new funding that Congress would have to appropriate for fiscal year 2020. So far all the work has been done under nontraditional contracts managed by the Air Force’s Space Enterprise Consortium. The consortium was established in 2017 to attract startups and commercial companies, and to bring new space technology into defense programs. The director of the Missile Defense Agency, Air Force Lt. Gen. Sam Greaves, said this will be a "disciplined acquisition process" that he described as "crawl, walk, run, under-promise, over-deliver. … Prove things in the laboratory, prove things on the ground, maybe go to air, maybe go to space if that's where it ends up." How the Pentagon proceeds with this project over the next year could set the stage for success, or failure. Missile defense programs have been notorious budget busters in decades past, including the military's current missile warning satellites, the Space Based Infrared System known as SBIRS. Griffin would not offer any cost estimates for the Space Sensor Layer. He said Congress is "asking us to do it" and did not set a price limit. "I am personally not concerned about the cost of the Space Sensor Layer," he said. "It's not some outlandish number." The Missile Defense Agency would not discuss the contents of the nine contractor proposals it received. Industry sources said the majority recommend that the sensor layer be placed in orbits close to Earth to it can more conclusively identify hard-to-detect targets like hypersonic glide vehicles. The thinking is that adversaries will likely launch missiles tipped with a mix of warheads and decoy balloons to confuse U.S. sensors. "We have to be closer to the action in order to do a good job of it," said Griffin. "We think the best approach is a network of satellites in low orbit. How many, what orbit, all that is to be determined." A major unknown is whether Congress will go along. The Pentagon unsuccessfully tried a decade ago to develop a missile defense constellation in low Earth orbit and will have to persuade skeptics that the Space Sensor Layer will not end up like other Reagan-era missile defense boondoggles. "It's ambitious," said Laura Grego, a missile defense and space security experts at the Union of Concerned Scientists. There is a case to be made for a space layer in lower orbit to track targets from launch to interception, she noted. SBIRS satellites in geosynchronous and highly elliptical orbits detect launches, and then cue radars on the ground that can continue to track the target in its mid-course and beyond. The sensors pass the tracking data to command centers where operators cue interceptor missiles to take down the target. "We set up radars along the path we imagined a North Korean missile would go," Grego said. "It works ok against North Korean missiles. But the idea of the sensor layer is that it would catch any trajectory from anywhere." Grego said the Pentagon should put forth a cost estimate and prove the system works in tests before it deploys any new satellites. Efforts to deploy missile defense sensors in low orbits go back to the 1990s. The Air Force at the time began plans to launch a "SBIRS low" constellation in 2006 to supplement the coverage provided by SBIRS high. The SBIRS low program in 2001 was transferred to the Missile Defense Agency where it became the Space Tracking and Surveillance System. It wasn't until 2009 that the agency launched two Northrop Grumman-made STSS satellites into low-Earth orbit. But costs escalated, and the Pentagon abandoned the original SBIRS low goal of a 24-satellite constellation. The program was later renamed Precision Tracking Space System (PTSS), intended to be a constellation of nine to 12 satellites to detect and track ballistic missiles and warheads in flight. As things stand today, the Air Force operates the SBIRS high constellation and has committed at least $3 billion to develop a follow-on system called next-generation Overhead Persistent Infrared, or next-gen OPIR. How SBIRS, next-gen OPIR and a new sensor layer come together into a broader missile shield is one of the central questions that lawmakers will likely ask. Can DoD afford both layers? And could SBIRS or next-gen OPIR provide more coverage to address hypersonic missiles? It will be a technical, political and economic debate. The Pentagon will have to convince critics that this will not be a repeat of SBIRS low, STSS and PTSS. The argument in favor of having sensors in LEO is that they can see better, and they would be cheaper to build and launch than billion-dollars SBIRS satellites. A potential counter point is that the next-gen OPIR satellites that the Air Force already funded will be equipped with more advanced sensors and, conceivably, could do with a few satellites the same job that would require 100 satellites in LEO. Griffin's advocacy of a LEO constellation for missile defense goes hand in hand with his support of Blackjack, a Defense Advanced Research Projects Agency effort to adapt commercial space technology for military use. Sometime in the next two to three years, DARPA plans to launch a small experimental constellation of commercial satellites in LEO, equipped with military payloads. The concept behind Blackjack is to capture the innovation in commercial space and lower the cost and development timelines of military systems. Griffin has been hugely critical of the Air Force's costly satellite developments and views Blackjack as the Pentagon's best hope to move into a new era of faster, cheaper space systems. DARPA said missile warning could be one of the potential applications for Blackjack satellites. If the program is successful, it could serve as proof that a Space Sensor Layer can be achieved at lower cost than traditional military satellites and produced on timelines of one to two years, compared to seven to 10 years for most DoD systems. DARPA has set even more ambitious goals for Blackjack. It wants to demonstrate the use of "smart" satellites on orbit that can collect, analyze and disseminate data autonomously, and possibly even cue interceptor weapons. This could dramatically reduce the time it takes to respond to a missile attack. 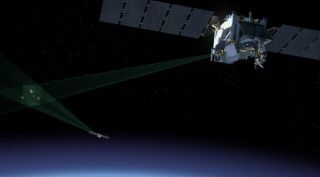 SBIRS data, for example, is sent from space to command centers on the ground, where it is combined with data from other sensors and analyzed before it is passed on to the interceptor weapons. Griffin noted that one of the issues that need further study are the "fire control approaches" for the Space Sensor Layer. Hypersonic missiles are projected to fly much faster than ballistic missiles, so the latency of the data would be a critical factor. DARPA is tackling this issue in the next phase of Blackjack, called Pit Boss. "This is the technology that is the real 'DARPA hard' problem," the industry source said. Computers on Blackjack satellites would process data from the entire constellation and autonomously identify what weapon on the ground might be positioned to intercept a target. DARPA has been working on a solicitation for industry proposals for the Pit Boss phase of Blackjack. Autonomous onboard processing and dissemination of data from space would break new technological barriers, experts said, although it is unlikely to be used in the Space Sensor Layer, at least for the foreseeable future. One of the wild cards in the Space Sensor Layer project is whether it will remain under the Missile Defense Agency. There is an effort underway to establish a Space Development Agency — that would report directly to Griffin — to take on projects like the Space Sensor Layer. Acting Defense Secretary Patrick Shanahan and Griffin have argued that the Pentagon's traditional procurement organizations are not able to capture technologies from the private sector and apply them to military systems in a timely manner. The Space Sensor Layer could be one way to test the capabilities of the new agency.